A kitchen utensil that is used as a tool when eating snails in the shell. 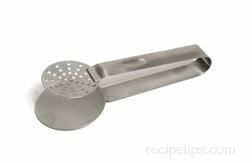 This utensil is made of stainless steel and has two connected handles with a set of curved clamps or tool heads with openings. The curvature of the tool head is shaped to hold the shell of the snail securely so a shellfish fork or pick can be inserted through the opening in the head of the tongs and into the opening of the shell in order to get access to the snail meat. To prepare snail meat, a Court-Bouillon is commonly made as a cooking stock in which the snail will be cooked. A Court-Bouillon will contain white wine, water and seasonings in which the snail meat is cooked for 1 to 2 hours depending on the amount of meat being prepared. If snails are to be prepared with their shell, several options can be considered so the shell can be used for the food presentation. As the first option, the meat can be kept in the shell which requires some type of washing to occur. A typical bath will include soda powder, rinsed and wash thoroughly over the snail, and then a boiling of the snails in water to sterilize the shell and contents. If however, the meat is to be removed from the shell for cooking, the process involves separating the meat from the shell and a sterilizing the shell separately. After the meat has cooked, the shell is then filled with butter. The snail, which may also have a coating of butter or sauce, is then placed back into the shell and served individually. 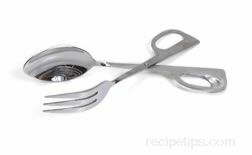 Small seafood picks (forks) are often used as the utensil to remove the meat while holding the snail in hand, or the best way to hold the snail is by using a snail tongs to securely keep the shell steady while a pick easily removes the stuffed meat.